Richard has been a regular member of the audience from the SGCO’s foundation in September 2004. As a longstanding patron of the St. George’s Arts Festival, he has become increasingly involved in “The Arts at St. George’s” since retiring as a Lloyd’s Underwriter in December 2008. He comes from a musical family and music has played a major part in his life from a young age. Richard played the violin until the age of 15 when he says he felt obliged to give it up following numerous protests from feline friends, and others! His passion for singing began while at school and he undertook solos as a boy treble outside school including the role, in concert, of Oliver. Since leaving school he has pursued his interest in singing and has sung in a number of secular choirs ranging in size from madrigal groups to large choral societies and several church choirs. He has also performed as a baritone soloist. Richard joined St. George’s Parish Church Choir in 1992 and sings regularly with the choir there and on its regular visits to English cathedrals. 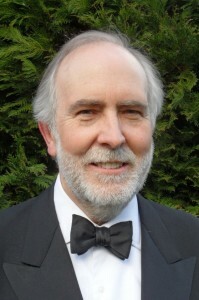 He has been a member of the St. George’s Players since 1994 having first taken to the stage with the St. Oswald’s Players Norbury in the 1970’s and 1980’s with lead roles in a number of Gilbert and Sullivan operettas. During his 37 year career at Lloyd’s he worked initially as a broker and then transferred to underwriting principally writing North American Non Marine business. As an established leading underwriter one of Richard’s numerous specialities was insuring high value items of fine art and jewellery for professional entertainers, the ‘Burton Diamond’ being one example. He also led insurance for high value and rare musical instruments in particular stringed instruments made by the Stradavari, Amati and Guarneri families and even a violin by Silverio Ortega, father of the maker of Dominic’s violin! At the other extreme he insured instruments for pop stars and groups. He has been married to Sue since 1984 and has three grownup children. In 2011 Richard was asked to review the role of the SGCO in the St. George’s family and this ultimately resulted in him becoming involved in the running of the orchestra in January 2012. He was appointed Operations Manager in July 2012, a new and essential but voluntary position and role.